The ITR forms for each year are notified after end of the financial year incorporating changes applicable from the relevant financial year. The Income tax department has notified new ITR forms on 1st April 2019. Since this is a personal finance page, the discussion is restricted to provisions of new ITR which are applicable to Individuals only. 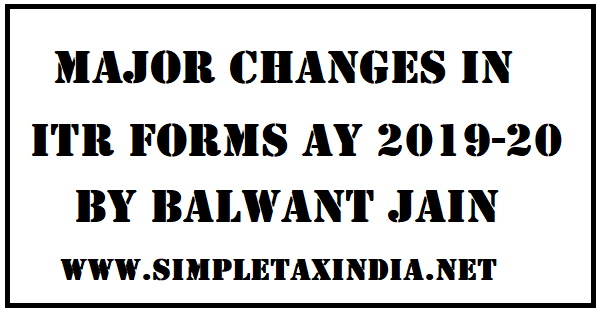 Let us learn what has changed in the new ITR forms for you. The conditions to be satisfied for being eligible to use some of the forms have become more restrictive. Till previous year resident individuals could use ITR 1 if their source of income comprised only of salary, income from owning one house property and income from other sources and the total taxable did not exceed Rs. 50 lakhs. So you could not use ITR 1 if you had business income or had taxable capital gains. You also could not use ITR 1 if you had any asset outside India or had an signing authority for any foreign account or had any foreign income. Likewise you were not eligible to use ITR 1 if you were claiming benefits for taxes paid outside India or had agricultural income exceeding Rs. 5,000/-. Now more restrictions have been imposed to disqualify certain individuals from using ITR 1. So if you are director of any company or have investments in unlisted company in the previous year, you cannot use ITR 1 for the financial year ended 31-03-2019. The directorship may be of listed company or an unlisted company. Likewise investment can be in any private limited company or a public limited company which is not listed. Even if your income includes income of any other person on which tax has been deducted you cannot use ITR 1 for this year. Moreover in case you are offering any income under the head “Income from other Sources” and claim any expenditure in respect of such income, you can not use ITR 1. This restriction will cover cases of letting out of plant and machinery and furniture or subletting of any property where depreciation and interest etc are claimed. It would also cover cases of salaried people who earn some income by moonlighting and claim any expenditure against such income. This restriction however would not apply in case of income in the nature of family pension on which you can claim standard deduction upto 1/3 of the pension subject to a maximum of Rs. 15,000/-. Likewise there are some changes in eligibility criteria to use ITR4 which is used in case you have any business income taxable on presumptive basis. Till last year there was no monetary restriction in terms of total income for using ITR 4. From this year, one cannot use ITR 4 if the taxable income exceeds Rs. 50 lakhs in which case one will have to use ITR 3. Likewise even non resident could use ITR 4 but from this year only resident Individuals will be able to use ITR 4 subject to fulfilment of certain other conditions. The additional restrictions which have been made applicable to ITR 1 equally apply for filing ITR 4. Likewise you will not be able to use ITR 4 if you have any brought forward losses or losses to be carried forward or owned more than two houses. There are no changes in eligibility criteria for filing ITR 2(used by HUF, Individuals who can not use ITR 1 and who do not have any income taxable business income) and ITR 3 (used by all the individuals who can not use either ITR 1, ITR 2 or ITR 4). Those who are filing ITR 2 or ITR3 have to provide history of their stay in India to help the income tax determine your residential status for income tax purposes. Moreover in case you derive any rental income from house property on which tax has been deducted, you have to provide the details of TAN/PAN of the tenant for claiming the credit for the tax deducted by the tenant. Likewise in case any tax has been deducted by the buyer in respect of sale of any immovable property sold by you, you have to mandatorily furnish the details of the PAN of the buyer for claiming the TDS credit. Till previous year only two category of taxpayers were allowed to file their income tax returns in physical form. This included individuals who have completed 80 years of age, referred to very senior citizen, before end of the year and were only using ITR 1 or ITR 4 The other category included the individual tax payers whose taxable income did not exceed Rs. five lakhs and who were not claiming any refund for the excess taxes paid/deducted. Now only the very senior citizen individual taxpayers using ITR 1 and ITR 4 will be entitled to file physical returns and all other Individuals will have to file their ITR electronically, which can be verified in several way like verification through One time Password, singing the ITR V and sending it to CPC Begluru and by signing the ITR through a digital signature.